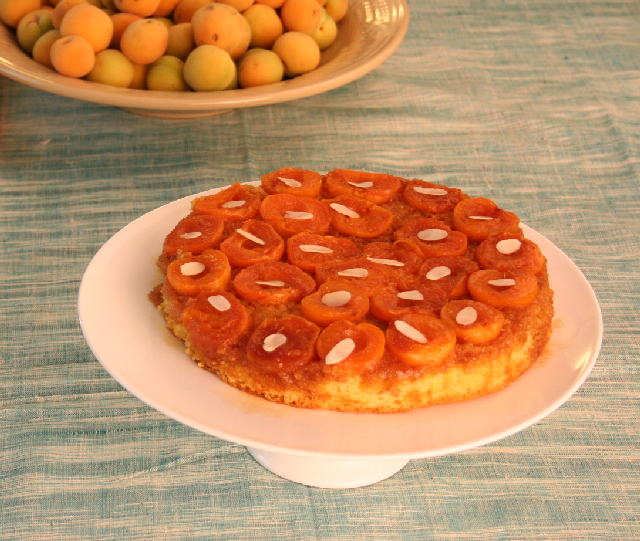 For this week’s Mint column, I made a gooey Jaggery and Apricot Upside Down Cake using the gorgeous Himachal apricots that are in the Delhi markets at the moment. I got to sneakily take a few pictures while (Mint photographer) Priyanka had her lights out – love these oranges and greens. // My book group is the social highlight of every month: The company is great, the wine flows, the food is always gorgeous and sometimes we even get round to discussing the book. This month we’ve been reading The Help by Kathryn Stockett; a gripping tale of racial discrimination and kitchen drama set in 1960s Mississippi. Of course, I was moved by the plight of the black maids in the story and swept along by the struggle for equality, but for me the real hero of the book is the food. The pies, puddings and roasts of the Deep South are so vividly depicted that you can almost taste Minny’s Caramel Cake, one bite of which, we learn, can “make you feel loved”. Almost, but not quite, so I decided to try and recreate some of that magic in my own kitchen by “caramelizing” an old favourite from my childhood. The “Upside-Down Cake” is a classic from the 1970s where fruit, sugar and butter are put into a cake tin and a cake mixture is then spread on top. When cooked, the cake is inverted and the sticky toffee fruit is on top. In the very un-exotic Britain of the time we had to make do with tinned pineapple but one of the great compensations of an Indian summer is that we’re spoilt for choice with all the magnificent soft fruit from Himachal: cherries, apricots, peaches and soon, plums. I chose apricots as they’re particularly plump and flavoursome this year.I also had a hunch that jaggery might provide a more intense caramel hit than the traditional white sugar and butter. The jaggery didn’t disappoint (how could it? ), turning this old faithful into a real heart-stopper, drenching the apricots and almondy sponge in what can only be described as a loving spoonful. I’ll never know how it would rate alongside Minny’s Caramel Cake but the look on my daughter’s face when she took her first bite told me she wasn’t thinking about civil rights. And that’s good enough for me. Preheat the oven to 190 degrees Celsius. Line a 25cm round cake tin with aluminium foil—this is important especially if you’re using a loose-bottomed tin, to stop the caramel sauce from seeping out. Cut all the apricots in half and take out the kernels. In a heavy-bottomed saucepan, heat the jaggery and 6 tablespoons of water until the jaggery is completely dissolved. Bring to the boil and let it bubble for a couple of minutes until it starts to get syrupy. With jaggery this happens much faster than with white sugar, so keep watching. Leave to cool for a couple of minutes, then pour into the cake tin. In a pan large enough to hold all the apricots in a single layer, heat 300g caster sugar and 600ml water until the sugar has dissolved completely, then bring to the boil. 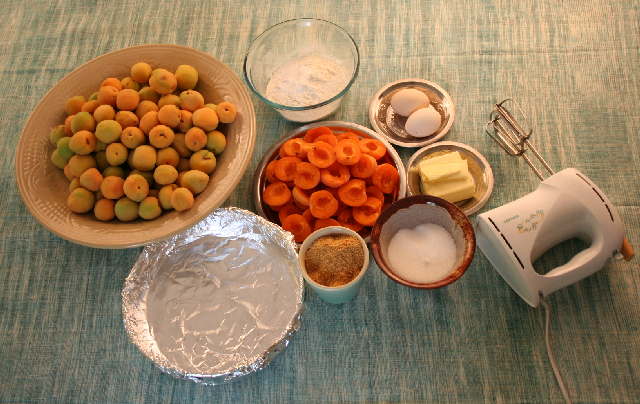 Working quickly, slide the apricots into the pan, cut side down. Boil for 1 minute, then turn the apricots over and boil for 1 more minute (don’t poach the apricots for more than 2 minutes in all because you need them to hold their shape). 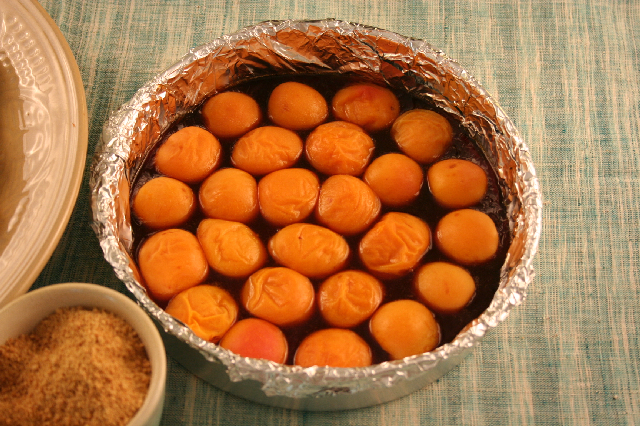 Quickly remove the apricots from the pan and arrange, cut side down, on top of the jaggery caramel. To make the cake, put the eggs, 100g caster sugar, butter, flour, baking powder and ground almonds into a bowl. Using either a food mixer, hand-held blender or good old wooden spoon, beat until the mixture falls off a spoon tapped on the side of the bowl. If it isn’t soft enough, add a tablespoon or two of the apricot poaching liquid. 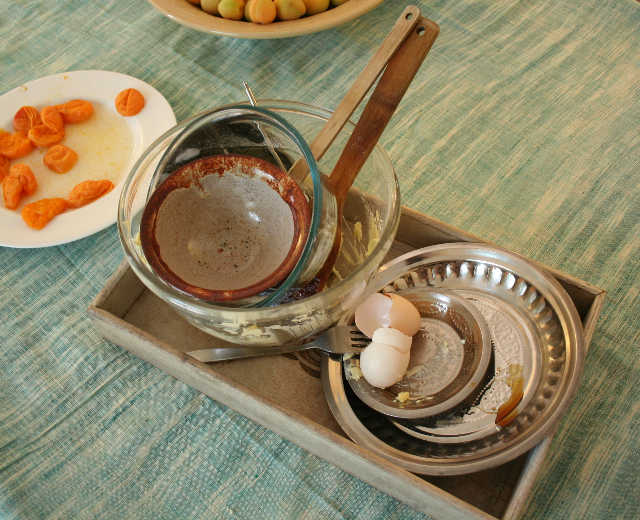 Spread the cake mixture on top of the apricots and jaggery. Bake for about 45 minutes or until a skewer inserted into the centre comes out clean. Let the cake cool for a couple of minutes, loosen the sides by running a knife around the edge, then place a serving plate on top of the tin. Carefully flip the tin over to let the cake rest, jaggery and apricot side up. Serve warm with a huge dollop of cream. Yay you Pam… looks like you’ve had a whole lot of fun here. Great looking cake. 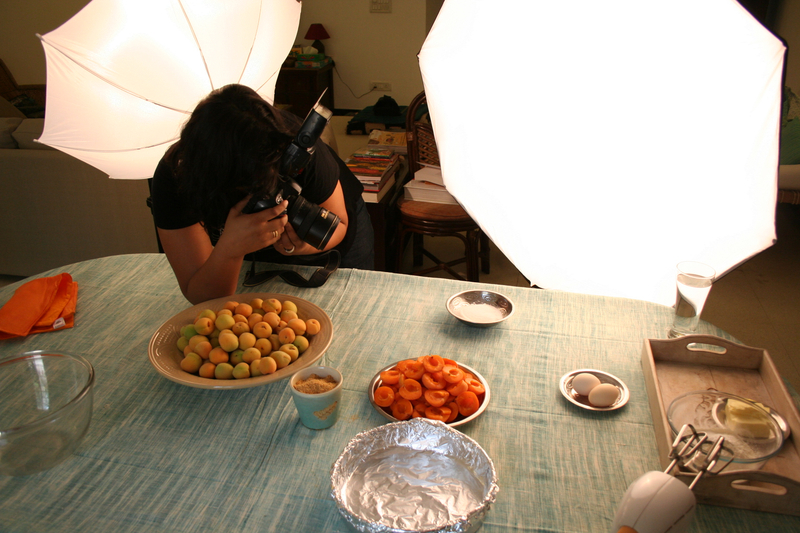 Am very intrigued with the jaggery in there, and I love the photoshoot, lights and all. 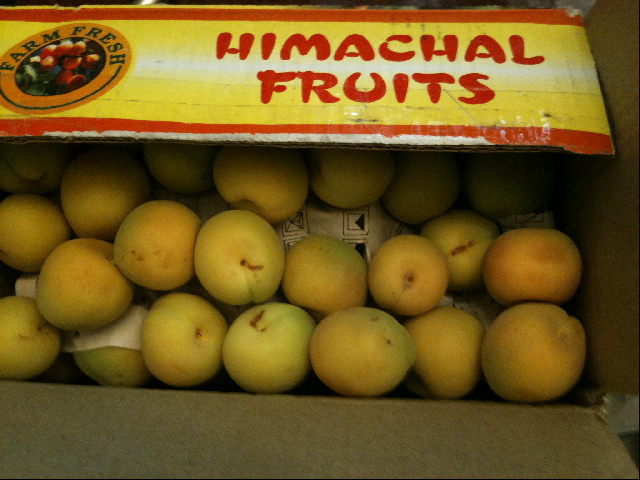 This year has certainly been very good for stone fruits, hasn’t it? I just can’t get enough of them! u always come up with such exotic recipes,..cake looks delicious,.. It has all my favorite ingredients . 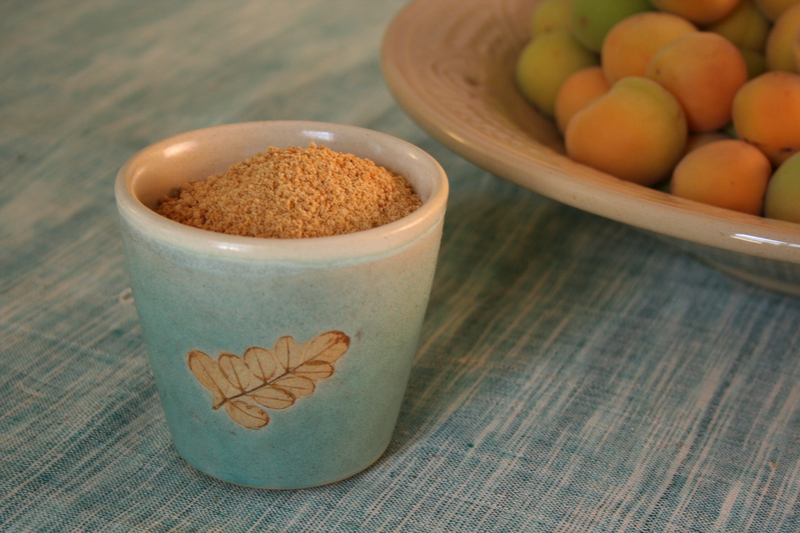 Jaggery is so good for everything you make with it i have tried cookies and plain ginger cakes with jaggery but this looks exotic , apricots really are so good this year. The pictures look stunning . Looks lovely. I am gonna try this with apricot in season here. Hi Sangeeta – I LOVE jaggery, my new favourite ingredient although when I went for supplies yesterday they told me it’s seasonal – is that true? wow….thats a lovely recipe…i just love baking cakes. This is something new and thank you so much for letting me know a new recipe for cakes are concerned. M definitely looking forward to know more recipe’s from u. My first visit to your blog….but definitely not the last :)!! !